My first experience of this brand of biscuit came rather curiously through one of the latest Dairy Milk flavours. Yes they launched Dairy Milk with Chips Ahoy filling before the brand had actually launched its biscuits properly in the UK, which is a bit weird. The Dairy Milk bar was filled with a soft filling of cookie dough, meaning that I assumed that the cookies would have a soft middle. 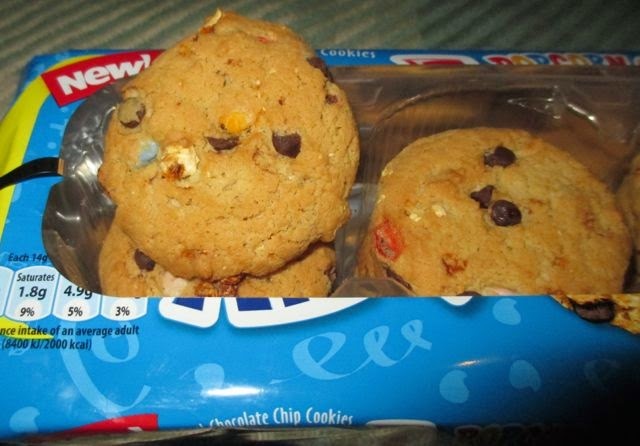 They are also American and as soft cookies here tend to be called “American style” this backed up that logic. 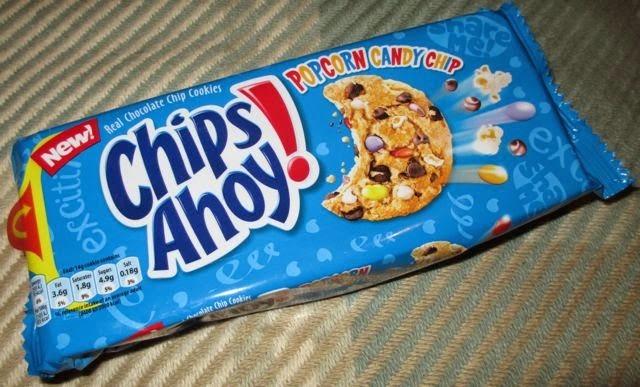 Chips Ahoy also have some bold exciting flavours, and the UK has launched with Popcorn Candy Chip, which means inside the biscuit are hard coloured shelled chocolates and popcorn pieces, which sounded like an interesting and fun combination. The biscuits look like they had a fairly generous amount of added ingredients, and there were flecks of colour and all sorts packed in. I must mention that the pack is resealable too, it has a giant sticker which you rip open to get to the contents but then sticks back down again when you are done, thus eliminating the need to transfer any remaining contents back to the biscuit tin! I really liked seeing that on the packaging, we need more like that in the UK. Flavour wise I was in two minds about these biscuits. There were plenty of goodies packed in, but the popcorn was lost for all but the texture. The chocolate bits added nice flavour, and a bit of a crunch. The texture of the biscuit themselves were quite hard, and not soft like I’d hoped, but still remarkably light. I enjoyed the biscuits, I thought the combination of ingredients were interesting, and I like the fact they chose popcorn as a slightly unusual flavour. It was just a shame the flavour of the popcorn didn’t shine through more and that the biscuits didn’t have that soft cookie feel I’d been hoping for. Having said that, I would but them again, and I would like to try more flavours.